The sweeping headlights on Hyundai's i30 are among styling touches shared with the Elantra sold in North America. FRANKFURT -- Hyundai Motor Europe hopes to sell 120,000 units of its restyled i30 hatchback in the car's first full year of sales, the automaker said. The i30 will get all-new sheet metal, a new interior and other improvements for its second generation when it goes on sale in Europe early next year. The vehicle made its global debut at the Frankfurt auto show. The i30's exterior was redone using the swoopy texturing and flowing lines of the automaker's fluidic sculpture design language. The changes, which don't extend to the platform, mark the car's first major styling overhaul since the five-door hatchback was launched in Europe in 2007. Since then, Hyundai Motor Europe has sold more than 360,000 units of the i30, Hyundai said in a statement. 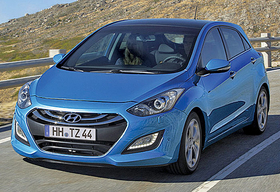 The i30's styling shares many design cues with the Elantra sold in North America, including the wraparound headlights and sculpted front fenders. Hyundai won't confirm whether the second-generation i30 will be sold in the United States, but company sources have said the car is scheduled to be launched in the U.S. market as early as next summer.